You have your class timetable and assignment due dates. Organizing the required activities requires a skillful approach to time management. You can now build in your preparation and other studies. Seminars and lectures may have only one hour slots and although teaching can go on till 9.00 p.m., this doesn’t happen very often. You may have only eight hours of formal teaching per week – or a lot more. In this plan, there are two assignment preparation or hand-in days per week. Each lecture has a follow-up seminar (with the same number) on the same topic and there is some project/workshop time. 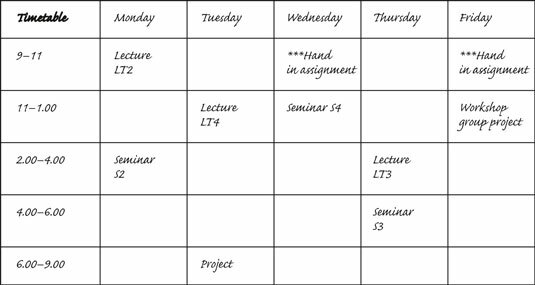 This timetable has three topics to prepare reading for each week, one for each lecture/seminar pair. The two exercises are based on the lecture/seminars of the previous week. Math, Economics, and Technical students as well Arts students who need to handle large amounts of information will almost certainly have regular exercises to practice using the formulae and methods introduced to them each week. Other exercises may be translations for language students, short experiments or other tasks which give practice in some of the methods or principles discussed in class. The workshop and projects relate to the third topic of the previous week, which is not assessed through an assignment, but through a report at the end of term. Any term examination is likely to include at least one topic from each week, though there will be a choice. Your reading list for each topic will tell you the main or core reading. You will probably find that one or two texts cover several topics over a number of weeks. See if you can borrow them from the departmental library, reserve them from the main library or buy them second-hand from the Student Union or other bookshop, especially if they are recommended to buy in the reading list. Buying a copy will probably save you time and possibly your sanity, and you won’t have to go through the hunting down process again before exams, as there will almost certainly be exam questions based upon highly recommended texts. You can always resell it later and get some of your money back. This means you can prepare for lectures and essays and exams – to a certain extent – at the same time and as you go along. However, the immediate planning is about how to use the space in your time-table for each week and where to study. You could prepare by reading for Lecture 2 on Friday afternoon and then prepare the related questions for Seminar 2 – you could ask for examples or explanations for things you haven’t understood – after Lecture 2 on Monday morning. You have a two hour break between the lecture and seminar on Monday, and, taking out time for lunch, you can probably do a good hour’s study before the seminar. You need to think where you would like to study, like the library, and whether on your own or with classmates, probably those attending the same seminar with you might be the most useful. Learning is mainly a co-operative process at college or university, rather than competitive. Your main competitor is yourself, to improve and learn as you go along. However, being co-operative doesn’t mean you won’t have arguments! It means sharing your thoughts and rationally defending them, and listening to those of others. Putting things into words is in itself a learning process. It may seem a bit early, but the subject or school office may well have copies of recent exams that you can look at or get a copy of. You may be able to view them on line. This is important, especially if you have exams each term. You should be able to detect a thread between the exam questions and lecture/seminar topics to bear in mind and keep on the back-boiler. If you can’t detect a thread or an exam question seems to relate to a minor topic, this is a question you can bring up in the relevant seminar.